Sutton, you might recall, is responsible for a similar scheme at 555 Broadway, where he bought out the very same designer's lease in the Scholastic Building and installed Hugo Boss, which he represents. In the past, investors like Sutton have sought to control retail properties by buying storefronts through condominium transactions with building owners. 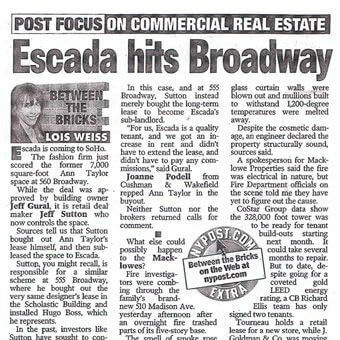 In this case, and at 555 Broadway, Sutton instead merely bought the long-term lease to become Escada's sub-landlord. "For us, Escada is a quality tenant, and we got an increase in rent and didn't have to extend the lease, and didn't have to pay any commissions," said Gural. Joanne Podell from Cushman & Wakefield repped Ann Taylor in the buyout. Neither Sutton nor the brokers returned calls for comment. What else could possibly happen to the Macklowes? Fire investigators were combing through the family's brand- new 510 Madison Ave. yesterday afternoon after an overnight fire trashed parts of its five-story base. The smell of smoke rose through the 30-story tower on the southwest corner of Madison Avenue and 53rd Street, where portions of the glass curtain walls were blown out and mullions built to withstand 1,200-degree temperatures were melted away. Despite the cosmetic damage, an engineer declared the property structurally sound, sources said. A spokesperson for Macklowe Properties said the fire was electrical in nature, but Fire Department officials on the scene told me they have yet to figure out the cause. CoStar Group data show the 328,000 foot tower was to be ready for tenant build-outs starting next month. It could take several months to repair. But to date, despite going for a coveted gold LEED energy rating, a CB Richard Ellis team has only signed two tenants. Tourneau holds a retail lease for a new store, while J. Goldman & Co. was moving there from a perch at Carnegie Hall Tower.